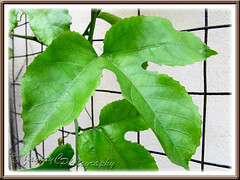 James of Garden Chronicles recently enquired on the current status of our Passiflora vines that were propagated from cuttings. 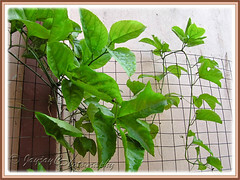 He was referring to the cuttings that we propagated successfully last August as pictured on the right. Thanks for asking, James…that was about 10 months ago and I’m touched that you remembered it at all! Well, due to space constraint and lack of proper support for the passiflora vines, we decided to maintain only one of the cuttings for our front yard. 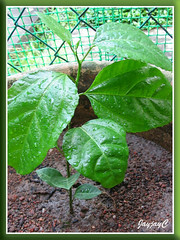 And, of course we chose the tallest amongst the three seedlings as seen in the left image! Besides that, the first seedling that was presented to us by a wonderful friend last July as pictured on the left, remains potted at the backyard. On the whole, both the vines are flourishing fairly well as they received sufficient sunlight and are watered regularly. These purple passiflora vines are vigorous climbers, scrambling all over the backyard chain-link fencing and even the Lady Palm canes close-by for support. In the front, it’s vining onto a steel wire netting. Climbing far and wide, the vine with its tendrils will cling or twirl around whatever they can grab onto. In less than a year, both the vines have reached between 4-5 m or more in length, with haphazard branching. Too bad though, that the vines are top heavy with the lower part of the main stem, bald and leafless. We’ve decided not to prune them until after flowering…we’re still waiting eagerly for that first bloom! Wonder how soon will they flower and bear fruits? Leaves come in all shapes and sizes. It can be 3-lobed or simple, ovate to heart-shaped or lance-shaped, broad to narrow, small to large. Some are flat, while others, recurved or curved inwardly. The young leaves will start off simple, serrated and without lobes. 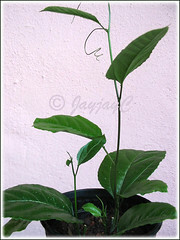 But, later as the stem or branch continues its growth length, newer leaves will become 3-lobed. Amazing, we didn’t know that this change will occur! Some of the leaves are even 2-lobed! That’s strange, and we thought they were deformed, probably due to some deficiency? Leaves may develop spots, blotches or have tiny bumps, and blades discoloured with yellow patches too. We assumed they were diseased and started removing them to nip the problem in the bud, but had ceased that since the ‘disease’ didn’t spread and seem to be concentrated on certain obviously exposed foliage only. Of course, these strange observations led me to research online curiously for the reasons for such diverse leaf shapes and changes on the Passiflora foliage. And, we’re glad to be finally educated and enlightened further on the matter, hopefully able to better tend them now, without confusion and wrong assumptions. 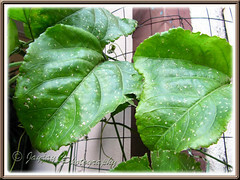 Different leaf shapes are used as a means to camouflage and keep the insect pests such as passionvine-eating butterflies from finding them. 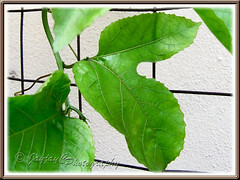 Sometimes, the Passiflora will mimic the leaf shape of other nearby plants too to escape detection from butterflies. 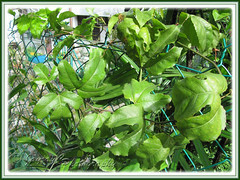 Most young leaves differ in shape from mature ones so that the vine can grow unhindered before caterpillars gnaw on the foliage. Some leaves will display tiny bumps (extrafloral nectaries) to mimic butterfly eggs as visual deterrent, hoping to confuse potential butterflies into thinking that they’re already taken by other females. Smart trick, huh? We’re absolutely thrilled to find out and learn about these marvelous self-defence mechanisms of the Passiflora! God The Almighty is so awesome! Thanks, Autumn Belle…we’re waiting impatiently to see blooms! Keeping my fingers crossed for you that your plant is just acclimatizing to the new environment and will pick up fine eventually. 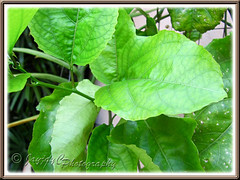 Im amazed at the wonder and beauty of your plant. Hopefully they will bloom soon with lots of flowers too. Thanks for your kind comments, James! Much appreciated.